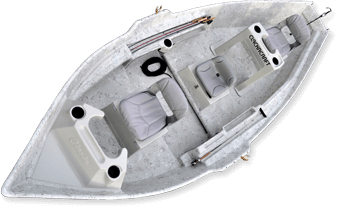 Designed by legendary wooden boat builder Don HIll, the Drifter accommodates two anglers. The Drifter is the perfect boat for mild rivers and still waters. This is the style of boat used by pioneer salmon fly anglers on the Smith, Eel, and other northern California and southern Oregon rivers. The Drifter can be handled by two people and fits in the back of pickup—no trailer required.